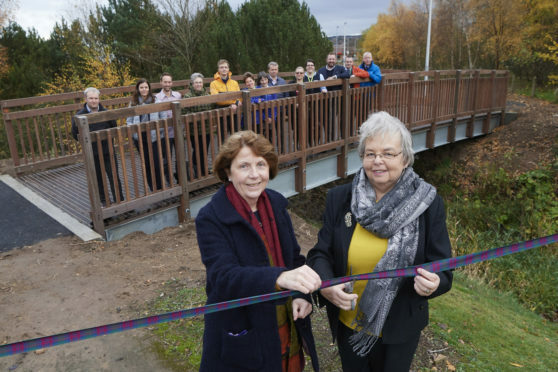 A new bridge providing access for members of the public to and from Inverness Shopping Park and local businesses was officially opened yesterday. Councillors Trish Robertson and Isabelle Mackenzie cut the ribbon yesterday to declare the bridge and footpath open. The project has been funded using developer contributions and funding from the Scottish Government through Sustrans Community Links award scheme. The route is part of a network across the Highland capital aimed at encouraging people to walk and cycle as they go about their daily lives. The project was managed by the Highland Council’s Project Design Unit with contractor MM Miller carrying out works. Inverness Millburn ward councillor Isabelle Mackenzie said: “We want to actively promote people to walk and cycle more but before this new pathway and bridge were built, anyone wishing to access the retail park from the hotels and local businesses and visa- versa would have had to walk or cycle right beside the very busy A96 road.